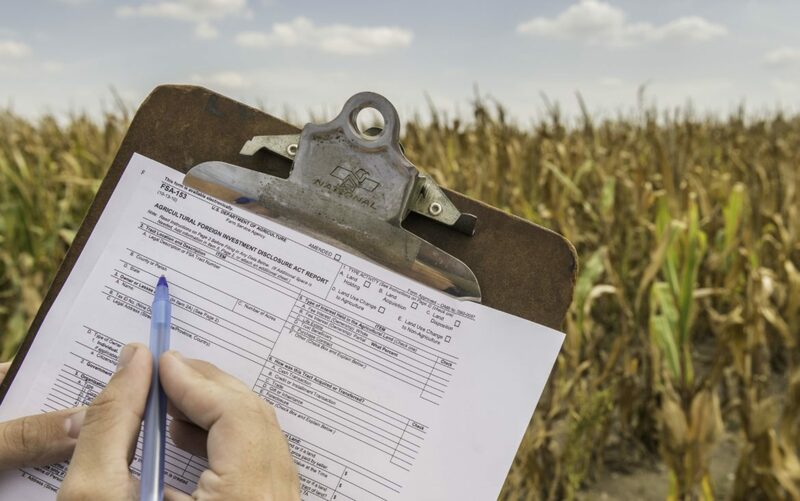 Foreign owners of agricultural land are required to fill out the FSA 153 form with the USDA. A law requiring foreign investors to report transactions of farmland to the U.S. Department of Agriculture has been on the books for almost 40 years. But as the amount of foreign-controlled farmland doubled in millions of acres between 2004 and 2014, the USDA has lapsed in enforcing the law, a review of USDA documents has found. About 27.3 million acres of agricultural land in the United States are controlled – either owned or under a long-term lease agreement – by foreign investors, according to a USDA database of foreign investment in farmland. Is there any foreign-held ag land near you? Search our database to find out. Even before the recent downturn in enforcement, the USDA only assessed 187 penalties between 2004 and 2010, valued above $667,000. But the largest fine of $111,266 during that time, which made up a sixth of the total, was the result of a company self-reporting its lack of compliance with the law. A separate USDA database on foreign investment in farmland reviewed by the Midwest Center showed that 27.3 million acres of agricultural land in the United States are controlled – either owned or under a long-term lease agreement – by foreign investors. Because the USDA has little capability to review filings of foreign investors, the result is that the USDA relies on companies to report errors. Foreign investment in agricultural land has been an area of concern for the past few years. In 2013, Chinese firm Shuanghui purchased U.S. pork producer Smithfield Foods for a record $4.7 billion. And this year, ChemChina, China’s state-owned chemical company, purchased Swiss agribusiness company Syngenta, one of the largest seed and crop protection companies in the world. German company Bayer is also in the process of purchasing St. Louis-based Monsanto. In an August policy brief, the Organization for Competitive Markets, a nonprofit organization focusing on antitrust and trade policy in agriculture, called for adoption of the legislation, as well as better enforcement of AFIDA. The fine for RMK Select Timberland Investment Fund I, LLC, was the largest fine since at least 2004, enforcement records show. Read more about Family Farm Action. Because of that difficulty, getting around the filing requirement— either by negligence or intention — would not be that hard, Vandiver said. But from 2004 to 2014, about 5.1 million was leased by foreign entities, largely foreign renewable energy companies, who lease the land for wind and solar farms. This land is valued at $8.5 billion. Most FSA-153 forms are filed with county offices and then forwarded to the USDA in Washington, though many companies with a large number of acquisitions file directly with Washington, Johnson said. Johnson said issues with the database could be because of issues merging the data, which is stored both in Kansas City and Washington D.C. GOING GLOBAL special report: studying abroad experience can give graduates valuable skills in areas such as communication and collaboration, in addition to cultural awareness, an increasingly sought-after trait in a global economy.